Qualcomm recently unveiled its latest SoC(System on Chip) - Snapdragon 845 for 2018 flagships in its "Snapdragon Technology Summit" being hosted at Hawaii. The new chip will sport the same 10 nm manufacturing process as its predecessor, but the company is altering its architecture some in order to bring even more of a focus to imaging. 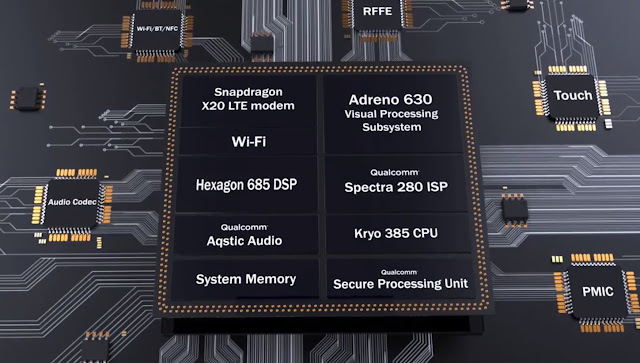 It includes including immersive XR experiences, an intelligent personal assistant and advanced vault-like security—is enabled by the Snapdragon 845 Mobile Platform. It also delivers up to 1.2 Gbps peak download speeds across a broader spectrum—our platform is smarter and faster than ever before. Deliver larger-than-life immersive experiences with the Qualcomm® Adreno™ 630 Visual Processing Subsystem (including GPU, VPU and DPU), featuring room-scale 6DoF with SLAM, Adreno Foveation, and a 30% improvement in graphics/video rendering compared to the previous generation. Experience fiber-optic speeds with the Snapdragon X20 LTE Modem. New flexibility means that more operators around the world can offer lightning-fast Gigabit LTE service, now with up to 20% faster peak and real-world speeds compared to our last generation X16 LTE modem. Users can also experience similar lightning-fast speeds with 802.11ad multi-gigabit Wi-Fi and integrated 2x2 802.11ac. Our energy-efficient Snapdragon 845 Mobile Platform is engineered for all-day battery life and includes our Qualcomm Quick Charge™ 4+ technology—capable of up to a 50% charge in only 15 minutes* so even the most demanding applications can run all day.